It is my sad... OK, actually fun duty to report to you that the monster that cannot die, the Condi Veep Rumor, has surfaced anew! Again! Now it's some idiot at the Washington Times, and it's a combination of hilariously wanton guesswork and pleading wouldn't it be great-iness, totally unfounded, completely contrary to everything we know about Condi, so naturally the blogosphere is reacting with great excitement and positivity. Here, for instance, is The Root, in a post which basically says "here's why this Washington Times guy thinks Condi's the perfect veep choice," while at News One for Black America, "The Grio" claims that the Times "reports that Condi is ready to get back into politics," even though they do no such thing. Next we jump the pond to the Daily Mail, where they claim that "speculation is mounting" about the rumors. No, really, it's just one guy at the Washington Times clicking his heels and making a wish. 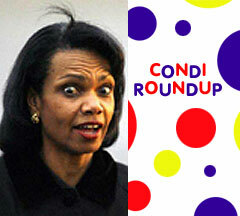 And that is how Condi Veep Rumors return from the grave, over and over and over and over again. Pony Pal™ Alex gets it exactly right, and offers yet more examples of false Condi Veep Rumors throughout the years over at Salon.